Costa Rica Roosterfish are Hard To Beat For a Fight of a Lifetime! 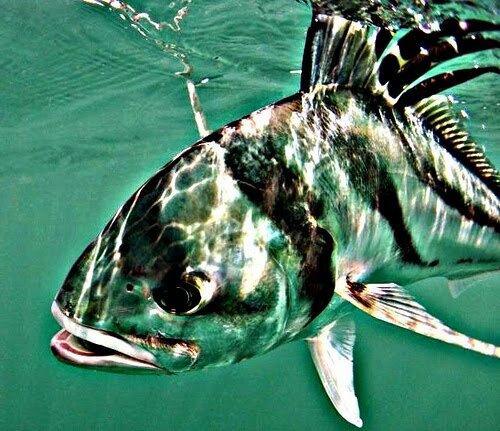 What is it about this wild, mysterious and incredibly difficult fish to catch on a fly that has many repeatedly chasing them in Costa Ricaaaaaa/Panama/Baja year in year out? I find that question difficult to asnswer as most of you would. I was fortunate enough to fish in Costa Rica years ago for these incredible fish and years later in Mexico...I'm still trying to figure the big boys out on a fly. Maybe my trip to Costa Rica the next few weeks will help me either put this to rest or continue my saga to catch one monster of a Rooster on a fly. Even after catching up with Running Down The Man's -Frank Smethurst a few times to gain insight, my knowledge still lacks and my 10wt still keeps asking me "when ya gonna get me something bigger than 20lbs?" Easier said than done there Gloomis settle down now! Here are a few Videos to those Rooster fanatics out there! Enjoy this Teaser from Costa Rica and hopefully what I have to look forward to. Not quite Costa Rica but one great video of Chasing Roosters on a fly down South. Can you ever get enough of this? One thing is for sure, you better bring some sunscreen, big gear and patience for these fish. The New York Times had a great write up not too long ago on these beauty's entitled "When The Roosterfish Start To Run, The Angler Tries To Keep Up"